We have a limited number of specimens that are experimental or one-of-a-kind specimens. 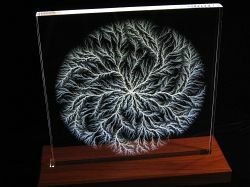 These sculptures are often more fascinating than our regular ones since they typically contain very unique patterns and a combination of chaotic or densely dendritic ("moss agate") discharges. 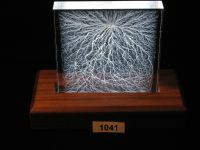 They are especially attractive when edge-illuminated by Light Emitting Diodes (LED's), as the light is reflected and refracted off the fractures that make up the Lichtenberg figure. 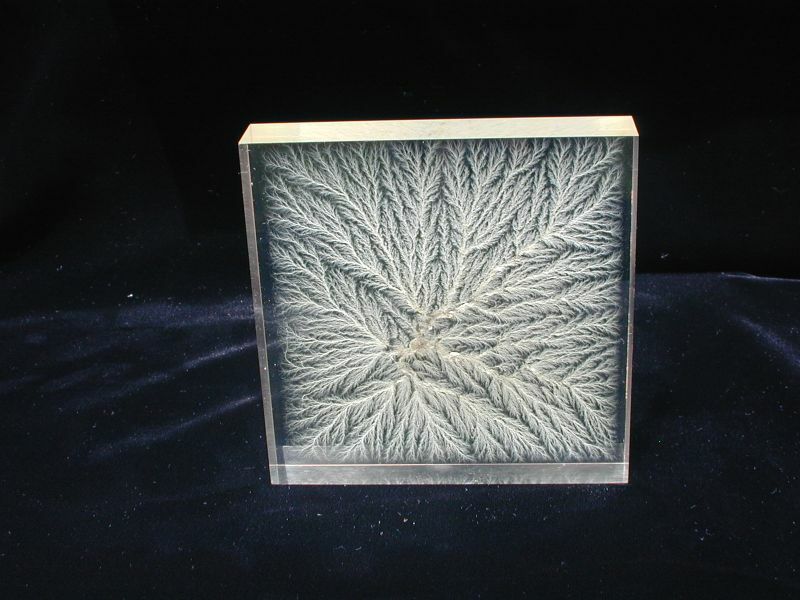 The thickest discharges often look almost crystalline. 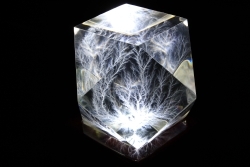 For specimens with multiple charge layers, beautiful star burst (or snowflake-like) discharges may also occur. 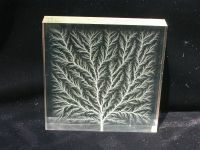 For example, see "Heavy Weather" specimens (such as Styles 16 or 25), where a combination of "snowflake" and chaotic discharges often occur. 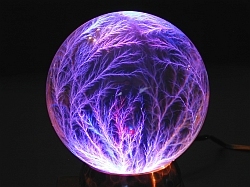 An image of a Style 16 "Heavy Weather" specimen that can be manually rotated can be seen here. Please remember that we may only have a small number of specimens in any given style. These are offered on a first-come first-served basis. Sorry, no individual photos are available - we guarantee you will be satisfied or your money back. Please review our Ordering Instructions BEFORE completing your order. If your order is shipping outside the USA, please make sure to select an international shipping option to avoid processing delays or cancellation of your order. We offer three international shipping options that allow you to balance your expected delivery needs versus shipping costs. Please note that some countries impose additional local taxes and fees (for VAT, tariffs, or local postal service charges). These are the responsibility of the buyer. Large specimens may require additional shipping cost because of their larger size and weight. 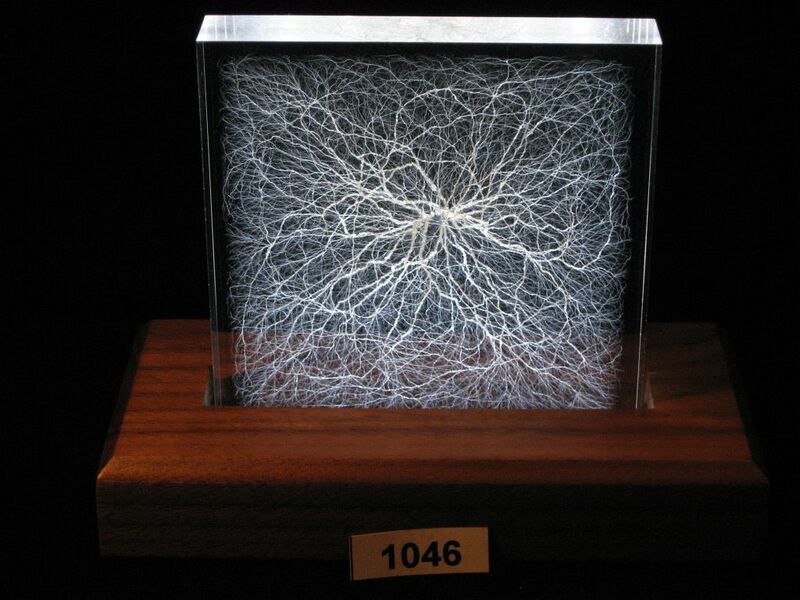 These are beautiful experimental specimens measuring approximately 4" x 4" x 1/2", similar to the sculpture at left (shown in a GSB1204L light base). These sculptures are similar to our thicker Style 5 sculptures except they are 1/2" thick instead of 3/4" thick. Otherwise, these are as every bit as beautiful as their thicker counterparts. 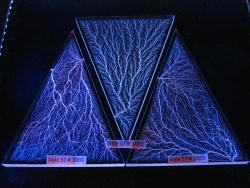 Sculptures have either a single branching discharge originating from one edge (as shown in the image) or radiating outward from at, or near, the center. 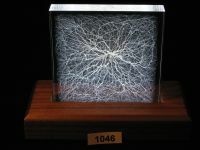 We recommend ordering a four-inch wide matching light base to safely hold and display the incredible detail and inner beauty of your sculpture. The GSB1204L base has an elegant brushed satin black anodized aluminum finish, with cool white LED's, and comes with your choice of 120 volt North American/US, or 240 volt EC (Europlug), UK, or AU power adapter options. Note: Light base is not included and must be ordered separately. Special: 20% discount vs our Style 7 sculptures! These are large, beautiful experimental specimens measuring approximately 6" x 6", similar to the Style 7 (shown at left. but Style 7A is 1/2" thick versus the Style 7 (3/4" thick). Otherwise, these are every bit as beautiful as their thicker counterparts. Sculptures will have a single branching discharge originating from one edge, from the interior, or near a corner - our choice depending on our current inventory. We recommend that customers also order a GSB1206L six-inch wide matching light base to safely hold and display the finest details and inner beauty of your sculpture. The GSB1206L base has an elegant brushed satin black anodized aluminum finish, with cool white LED's, and comes with your choice of 120 volt North American/US, or 240 volt EC (Europlug), UK, or AU power adapter options. Special: 23% discount vs our Style 10 sculptures! These are are large, beautiful experimental specimens measuring approximately 6" x 8", similar to the Style 10 (shown at left. but Style 10A is 1/2" thick versus the Style 10 (3/4" thick). Otherwise, these are every bit as beautiful as their thicker counterparts. 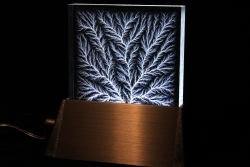 Sculptures will have a single branching discharge originating from a smaller edge (as shown). Most are almost completely filled to the opposite end, while others may have a small open area (1 - 2") towards the top. Our choice depending on our current inventory. We recommend also ordering a GSB1206L six-inch wide matching light base to safely hold and display the finest details and beauty of your sculpture. The GSB1206L base has an elegant brushed satin black anodized aluminum finish, with cool white LED's, and comes with your choice of 120 volt North American/US, or 240 volt EC (Europlug), UK, or AU power adapter options. 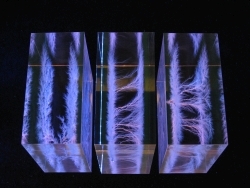 These are limited edition sculptures that were irradiated on one side, flipped 180 degrees, and irradiated again to create two independent charge layers, each located about 1/2" below the largest surfaces. 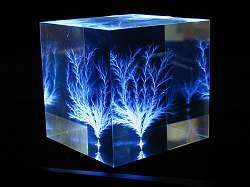 All have dendritic discharges. 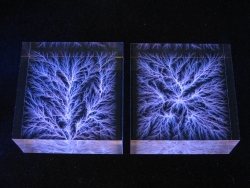 Two discharge types ("parallel planes" and "windblown lightning") originate from the edges, similar to the left specimen in the top image. 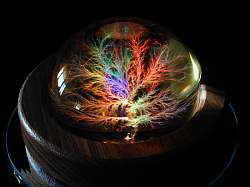 The remaining discharge type is an "African Tree" (kind of similar to an acacia tree). 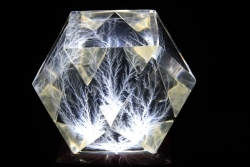 The discharge originates from the center of one of the large faces and connects to one charge layer, then spreads upward to the second layer. 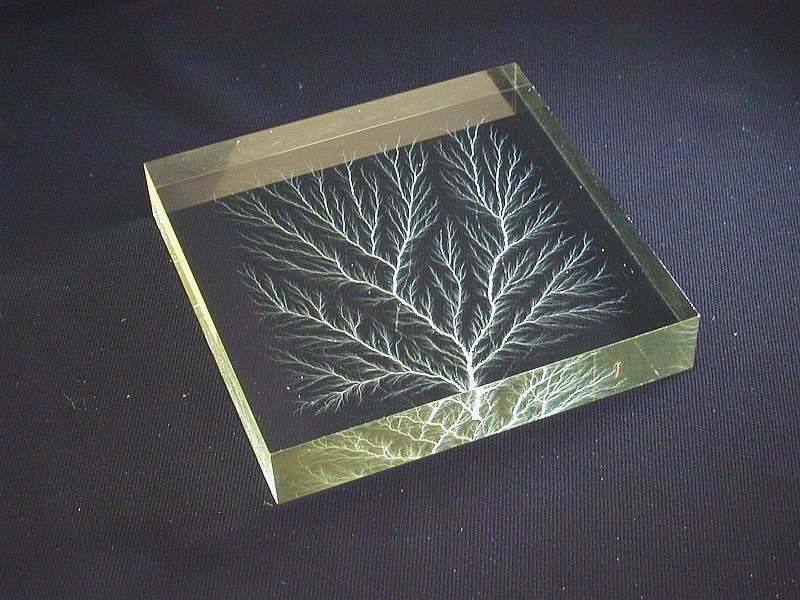 The lower image shows the two discharge layers and typical appearance from the side. 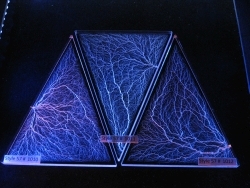 From left to right are parallel planes, windblown lightning, and African tree. The sculptures in the images to the left were illuminated along the edges by blue and white LED's using a special light box so that we could quickly photograph them. These are representative examples of the specimens we have in stock - your sculptures may vary from those shown, but we guarantee that you will be delighted. Recommended bases include the LM2688 rosewood light base with natural white LED's or our custom walnut DK25x75 base, available with cool white or electric blue LED's. Both bases are available with 120 volt AC adapters for North American/US, or 240 volt EC (Europlug), UK, or AU power adapter options. 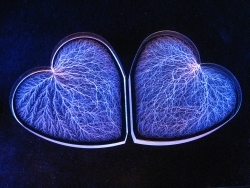 These beautiful lightning hearts were created as an experiment during our 2015 Lichtenberg Run. They all self-discharged while being irradiated, creating mostly chaotic discharges that originate from the inner vertex of the heart as shown. Sculptures are similar sculpture on the right side of the image to the left. They were illuminated along the edges by blue and white LED's using a special light box so that we could quickly photograph them. These are representative examples of the specimens we have in stock. Your sculpture will vary from those shown, but we guarantee that you will be delighted. Price shown is per sculpture. Recommended bases include the GSB1904L black anodized aluminum light base with cool white LED's or our custom natural walnut DK40x75 base, available with cool white, natural white, or electric blue LED's. Bases are available with 120 volt AC adapters for North American/US, or 240 volt EC (Europlug), UK, or AU power adapter options. These sculptures were irradiated while being rotated to create multiple independent charge layers, each located about 1/2" below each face. The images to the right show two different views of the same sculpture. 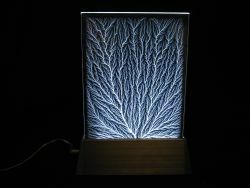 All have very similar interior discharges. 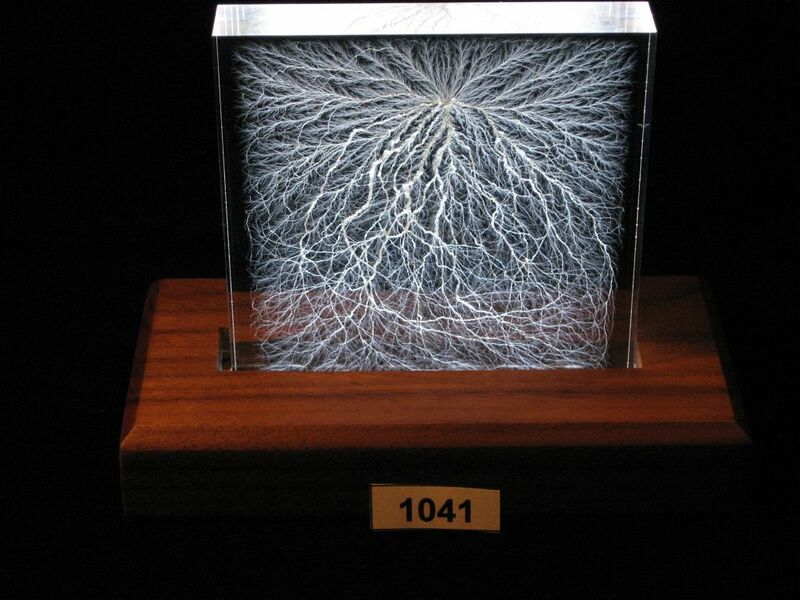 The branching 3D discharges are similar to those in our Ball Lightning spheres and Lightning Cubes. We created these as an experiment several years ago. Unfortunately, because of the high cost of the raw material we have decided not to offer them as a regular item. However, we do have a few left over, and when they're gone they're gone for good. The sculptures in the images to the left were illuminated along the edges by natural white LED's by one of our LM2699 light bases. Your sculpture may vary somewhat from the sculpture shown but we guarantee that you will be delighted. Base is not included. Recommended bases include the LM2699 or LM2690 light bases with natural white LED's, or multi-color color-changing bases such as the CR35MC, ROT45MC, or BD753MC. See linked page to order a matching base. Style 77, 3" x 3" x 3"
Isosceles Triangle - 30% discount while they last! These beautiful sculptures were created several years ago as an experiment. 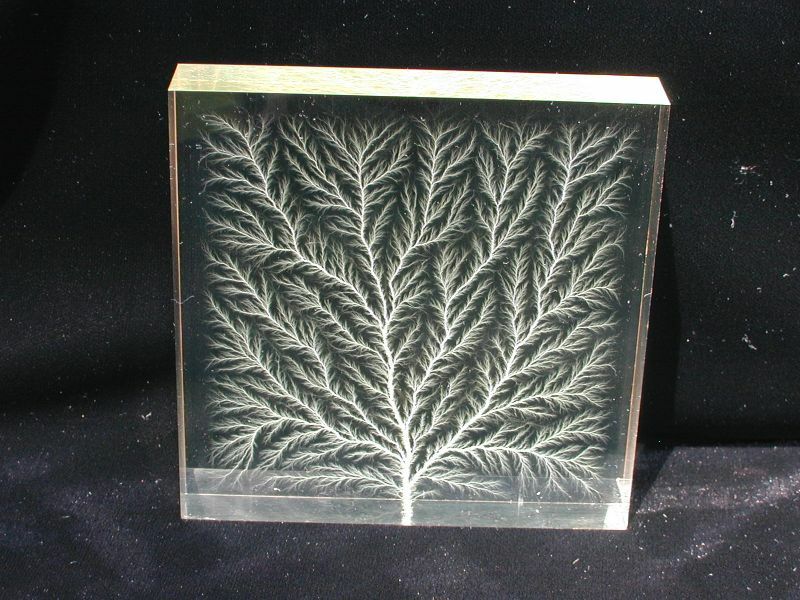 Many self-discharged while being irradiated, causing a complex mixture of chaotic and branching (dendritic) discharges. 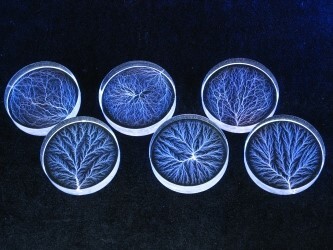 Others are mainly dendritic, with the discharge point(s) in one or more location. The sculptures in the image to the left were illuminated along the edge by blue and white LED's using a special light box so that we could quickly photograph them. These are representative examples of some of the specimens we have in stock - your sculptures may vary from those shown, but we guarantee that you will be delighted. We only have a limited number of these specimens, so when they're gone, they're gone for good. These sculptures work well with our GSB1206L black anodized brushed aluminum light base with cool white LED's. We only made a few of each size! These beautiful sculptures were created several years ago as an experiment. They're solid acrylic "bottles" that were machined out of cast acrylic cylinders. The smaller bottles measure approximately 2 x 6 inches, while the larger bottles are approximately 3 x 8 inches. Because of high fabrication and polishing costs, we do not intend to make any more of them and they are being offered at near our cost. 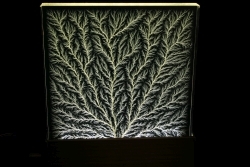 All sculptures self-discharged while being irradiated, creating a complex mixture of internal chaotic and branching (dendritic) discharges. 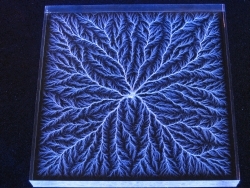 In the images to the left, each group was illuminated along the edges by blue and white LED's using a special light box. These are the only "Lightning in a Bottle" sculptures we have,, and once they're gone they're gone for good. Please note that a light base is not included and must be purchased separately. We recommend using the CR35MC, or ROT45MC for rooms with subdued lighting. For brighter areas, we recommend the BD753MC multicolor light base, the LM2690 square base, or LM2692 round wood bases with an array of five natural white LED's. AC adapters for the BD753MC and ROT45MC are available only for North American/US power. However, the ROT45MC can also be operated off three AA batteries, but the turntable does not rotate in order to extend battery life. All other bases can be supplied with 120/240 volt AC adapters for North American/US, EC (Europlug), UK, or AU power options. See linked page to order a matching base. Excellent "stocking stuffers" at a bargain price! These are cute little 2" x 1/2" thick disks with a laser-cut, flame-polished edge. 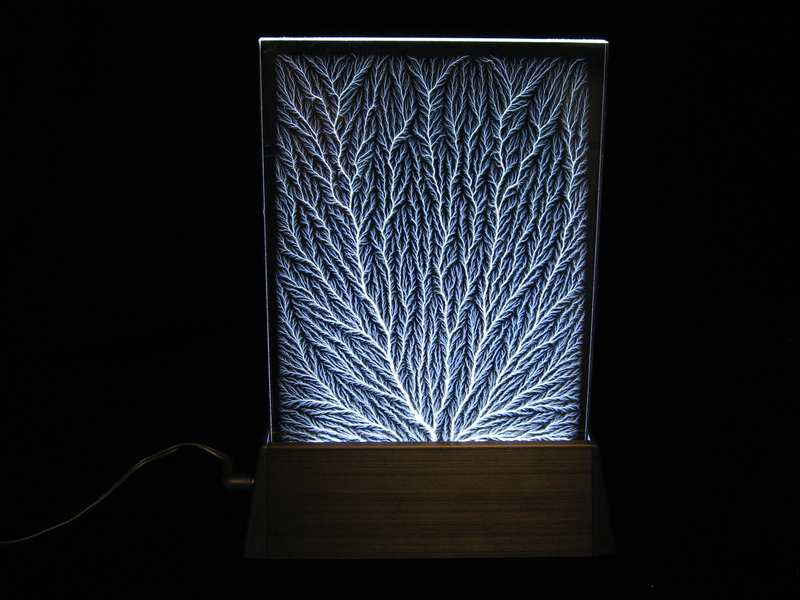 Most have one or more mixed chaotic/dendritic or dendritic (branching) discharges that have one or more roots within the interior or along the curved edge, similar to the specimens in the top row. 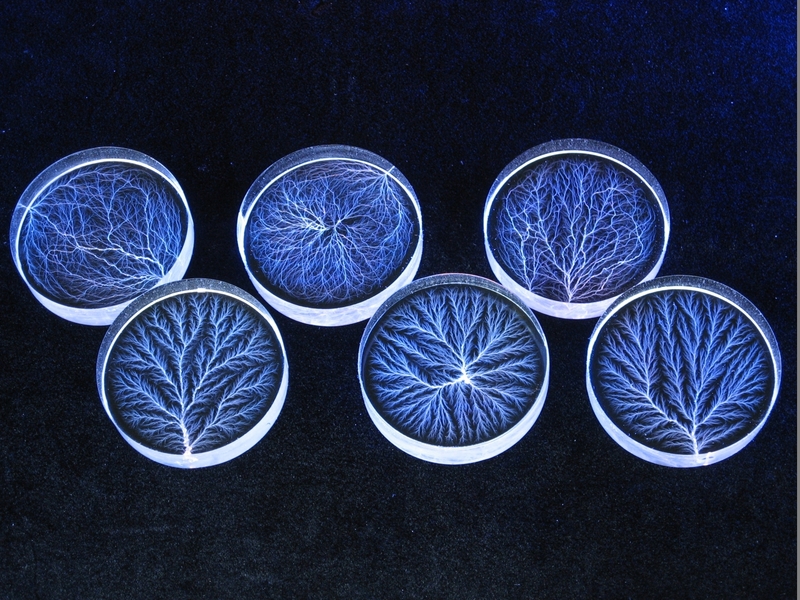 Most have branching (dendritic) discharges that originate from an edge or from a point near the center of the interior, similar to those in the bottom row. The sculptures in the image to the left were illuminated along the edge by blue and white LED's using a special light box so that we could quickly photograph them. 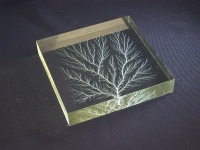 They're ideal as stocking stuffers, surprise gifts, marketing gifts, or small demonstration Lichtenberg figures for the math or science classroom. 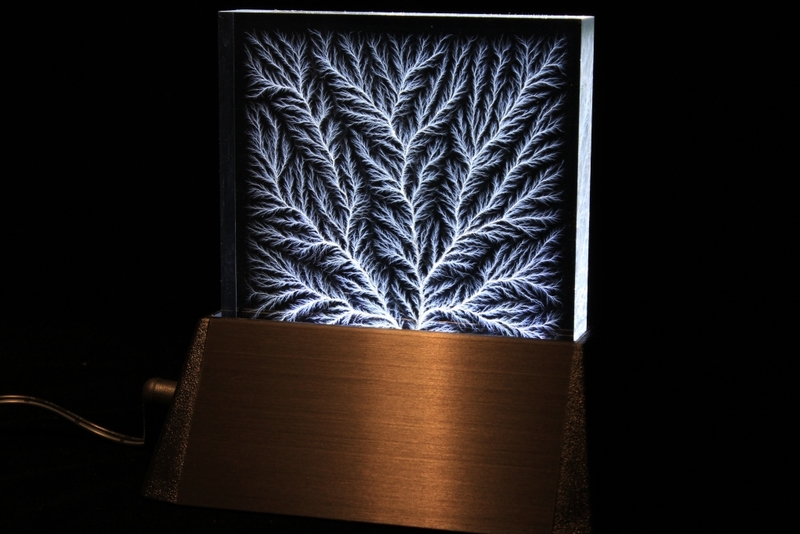 Unfortunately, we do not have any light bases that will work with these, but you can shine a small LED flashlight along the edge to beautifully illuminate them. assistance, or want to place a direct credit card order. Entire site is copyrighted, 1999-2019, All rights reserved. No portion of this page may be reproduced without consent from the author.